For the average shooter, reading the description on a box of ammo can make it feel like you’re deciphering a secret message. 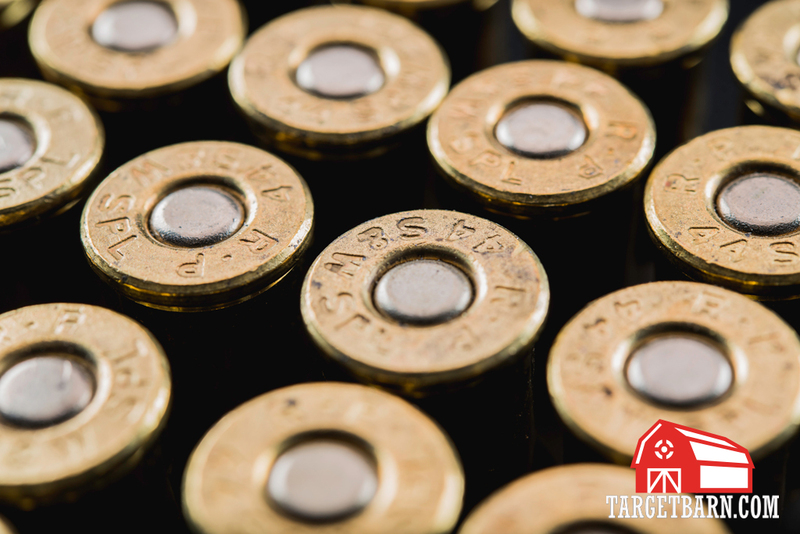 Ammo comes in many different flavors and between the terminology, abbreviations, and numbers, it can be overwhelming to figure out what it all means and bullet weight is just part of that formula. This article basically contains two parts. The first section is an explanation of what bullet weight is. Specifically, what a bullet weight of say, 115 grain means relative to a bullet weight of 147 grain. 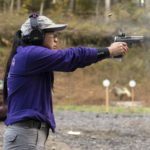 The second section of this article contains tips for using bullet weight to your advantage and how to adjust bullet weights to maximize your potential ability to remain on target. 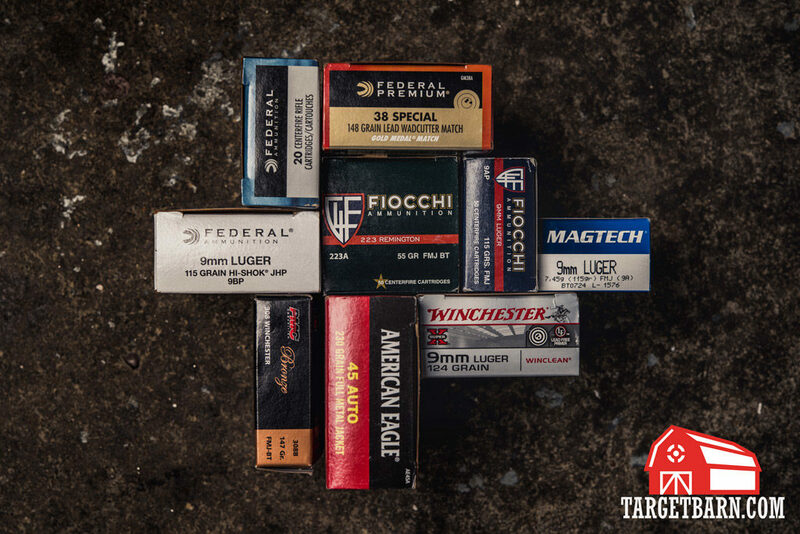 We frequently get questions about what all these descriptors on the box mean, and one of the most common questions is what “grain” is and what you should be shooting. We’ll get to the latter in a minute, but first let’s get an understanding of what grain actually is. What is Bullet Weight / Grain? A grain is a unit of measurement of mass. 437.5 grains equals one ounce. When you see “grain” (sometimes abbreviated as “gr.” or “grs.”) preceded by a number on a box of ammo, it is referencing the weight of the bullet. This isn’t the weight of the entire round of ammunition, but just the projectile that leaves the barrel. A common misconception is that the grain information on the box is referencing the powder found in a cartridge. Although gunpowder is measured in grains (and sometimes a single particle of propellant is referred to as a grain), this is mostly only relevant to reloaders and is not what the box is indicating. There are all sorts of slang terms for a round of ammunition. Sometimes these nicknames are misleading and cause confusion. For instance, in casual conversation a cartridge may be referred to as a bullet. In actuality, a single round of ammunition is made up of four basic components, with the bullet being just one of those elements. Two different 9mm bullet weights and types: 147 gr. FMJ rounds (left) and 95 gr. JSP rounds (right). Within each caliber, you will notice that there are certain bullet weights you see more often than others. For example, you’ll find Federal American Eagle 9mm ammo in, 115 gr., 124 gr., and 147 gr. These are the weights most commonly offered by manufacturers, though you may occasionally come across a less common weight that is usually made for specialty purposes. How does bullet weight affect shooting? So now we know that there are different weights for bullets and that this is measured in grains, but what does it mean for the shooter? Well, the weight of the bullet affects its performance once fired, including effects on recoil and accuracy. 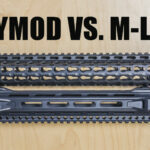 Recoil– The big debate is whether bullet weight affects recoil. Because there are so many factors that contribute to recoil, we can’t determine how bullet weight alone impacts it. Instead, we have to understand the relationship between bullet weight and recoil. Power factor is a measurement of the momentum of the bullet and is used primarily in competition settings to determine perceived recoil. It is calculated by multiplying the bullet weight by the velocity, then dividing by 1,000. Two different rounds could have different bullet weights and different velocities, but equal the same power factor. Theoretically, cartridges with the same power factor have the same recoil, though this isn’t always true and we need to look at the other factors involved. To learn more about power factor, check out this post. Lighter bullets must travel faster than heavier bullets to reach the same power factor and therefore require more gunpowder. This means that the lighter bullet will spend less time in the barrel than the slower moving heavy bullet, causing a difference in perceived recoil. Many shooters say that the light, fast bullet seems “snappier” while the heavy bullet’s recoil is more of a flat push. Other factors that can alter perceived recoil include barrel length, gun weight and design, and the shooter’s grip and stance. With all these variables, it’s near impossible to definitively say which bullet weight has the most effect on recoil. Accuracy- In general, you may find that your gun performs with better accuracy with a certain bullet weight. This can differ from gun to gun and experimenting with different rounds is the best way to figure out what works best for you. A heavy bullet may be less likely to be affected by external conditions such as wind, but it also may be harder to stabilize resulting in keyholing, or the bullet entering the target sideways. When should you worry about bullet weight? Your intended use is important and will help to determine what cartridge is best. Here’s a brief look at some common uses and some considerations to make for each. 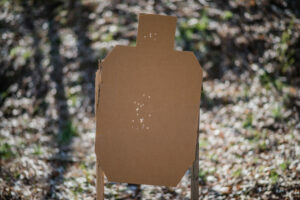 Range Training- There are many shooters who have never paid any attention to bullet weight. They typically shoot whatever is cheapest and most available without any problems. Shooters who just want to plink at the range can usually find an affordable round that consistently makes both their gun and wallet happy. Self Defense- If you’re choosing a self defense round, bullet weight should not be your initial concern. Bullet penetration and expansion are far more important than weight when selecting a round that will be used on targets other than paper and steel. Since the point is to stop a threat, you want ammo that travels deep enough into the target to hit vital organs while expanding enough to not leave the body and cause collateral damage. The Black Hills 9mm 115 gr. Tac-XP +P hollow point rounds pictured above are a popular self defense option. 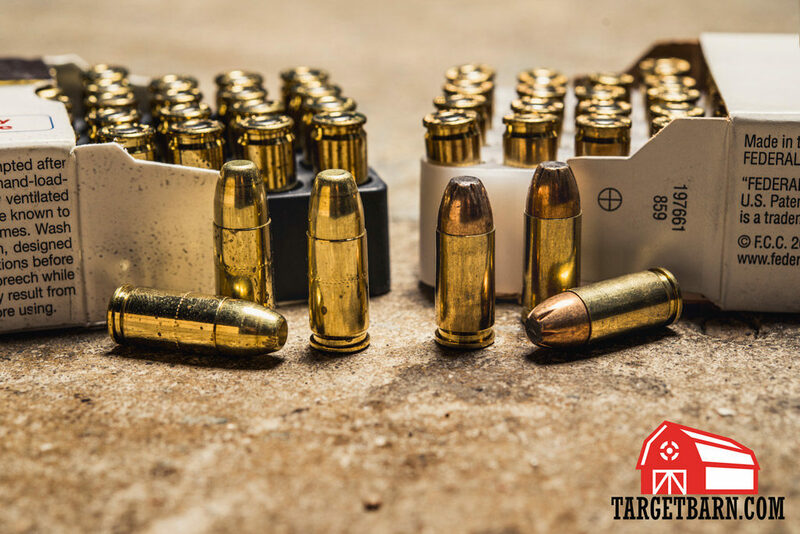 There are people who swear by a heavier bullet weight in their self defense rounds and it is true that certain brands and product lines have better track records than others. You may find a lighter bullet has performed consistently better than a heavy bullet in a ballistic testing (or vice versa); because of all the factors involved, relying solely on bullet weight is unrealistic. 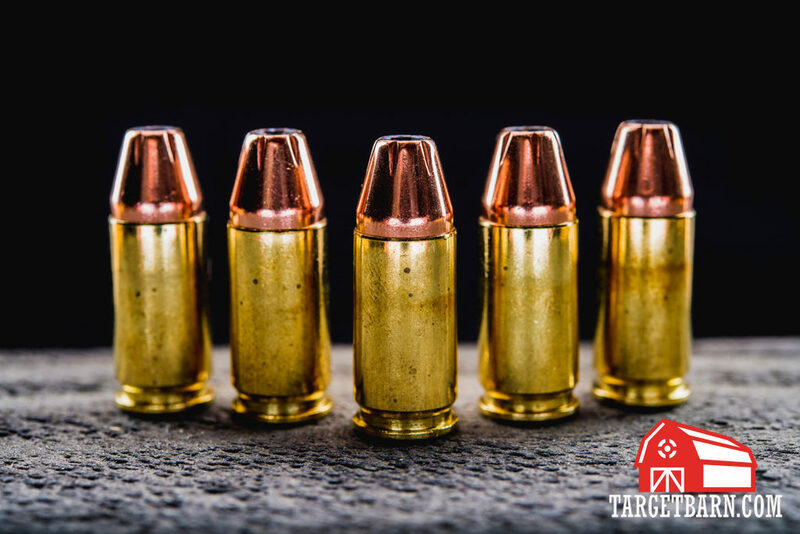 Take a look at the Federal Bureau of Investigation – it recently selected Hornady Critical Duty 40 S&W 175 grain as its official ammunition even though there are defensive rounds available in heavier and lighter bullet weights. 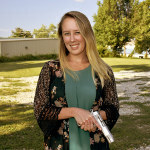 Features such as the no-clog hollow point bullet and a design and powder load specifically for use in a full size handgun contributed to the decision as well as consistent performance in testing. Ultimately, find a cartridge that performs well under testing or real world applications and most importantly, one that functions well in your gun. Some guns just don’t like certain cartridges and you want to know what your gun likes before you need to use it. Hunting- Picking out a round for hunting follows the same line of thinking as picking out a round for self defense – you want to stop (in this case, kill) your living target. Again, you need a round powerful enough to penetrate the vital organs of your target. Considerations that need to be taken include the size and anatomy of the game, the terrain, the distance at which you are shooting, and the laws and regulations where you are hunting. Selecting a caliber that is adequate for the game and conditions you are hunting in will be more important than any particular bullet weight. There are specialty rounds available specifically for the game you will be hunting, such as the Winchester Super-X .308 which is designed with a 180 grain soft point bullet specifically for deer and boar hunting. Precision Shooting- When shooting rifles at longer distances, bullet weight becomes more important. Because heavy bullets generally travel at a slower velocity and don’t rotate as fast, they can be harder to stabilize than a lighter, faster moving bullet. Your barrel length and twist rate will play a part in your ammo selection, with heavier bullets requiring a faster twist rate. The science behind long range rifle shooting is vast and confusing, but there are many precision shooters out there who can offer guidance and education on the topic. Competition- Depending on what competition venue and division you are competing in, power factor will probably be important to you and you will need to be sure your ammo is meeting the set requirements. Competition shooters want minimal recoil and the current trend shows shooters that compete with lighter polymer guns lean towards heavier bullets, while those shooting heavy race guns favor lighter bullets. There are many ammo options on the market, and bullet weight is just one of many considerations to make when picking out the right rounds for you. What works well in one gun may not be reliable in another, but by evaluating your needs and implementing a little bit of experimentation, you’ll be able to find the best fit for you and your gun. 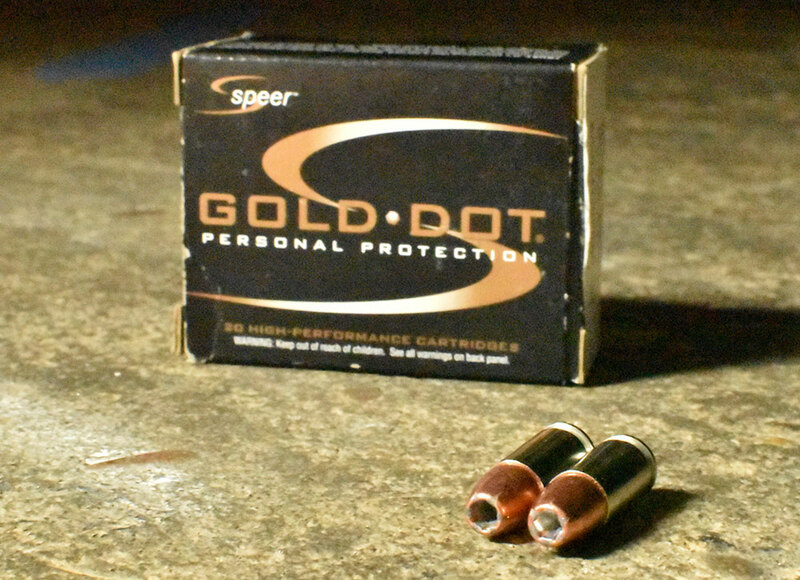 Two Speer Gold Dot 9mm cartridges. One is loaded with a 124 grain, the other a 147 grain bullet. Visually, it’s tough to tell them apart but when shooting, most shooters will feel a difference. All of this is good and fine in theory, but what does that mean to you practically? For most plinking at the range, not a whole lot. But there are three reasons why you might want to try a different weight bullet in the caliber you’re shooting. Handguns in particular often come with fixed sights that can’t be easily adjusted. It’s not unusual to be limited to doing no more than hammering the rear sight to one side or the other to shift your hits left or right. If your rounds consistently hit the target higher or lower than you want, then you have two options. 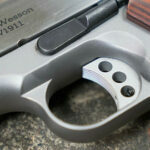 One is to put a new front or rear sight on your gun, if one is available. By changing the height of a sight, you can make them match the sight picture you’d like to see (your point of aim) for the hole you make on your target (your point of impact). The easier way, that doesn’t require taking a hammer to your gun or seeing a gunsmith to adjust your hardware, is to try changing the weight of the bullets you’re shooting. Unfortunately, there are no particular rules of thumb as to what will hit higher or lower. You’ll need to buy a box or two of ammo in different bullet weights, then shoot the best groups you can at different distances to see what works best. As you shoot those groups to see how high or low they impact compared to your preferred sight picture, you may notice that all else being equal, ammunition with different bullet weights might feel different in your hands. Lighter bullets traveling faster usually feel “snappier,” for instance. A heavier, slower bullet may have more of a “roll” or “push” by contrast. 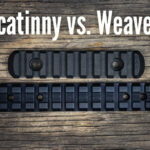 Which one is better? It depends on the shooter. Heavier bullets are often described as having less felt recoil, but perhaps not enough to account for other characteristics of how the gun feels and behaves through the firing cycle. Either way, if you find that you don’t like how your gun feels when you shoot it, changing bullet weights can be an easy way to adjust that. The other characteristic you might notice as you shoot groups for elevation is that you’re getting better or worse groups with different bullet weights, and your gun might be running more or less reliably between ammo types. Some guns, pistol and rifle, just “like” certain bullet weights or even certain specific ammunition types, better than others. There isn’t always any predictability to what that might be, so if you’re looking for maximum accuracy out of your gun, you’ll need to try a wide variety. Even if you’re satisfied with what you’re getting out of your current ammo of choice, it can be worth trying others from time to time to see if you can do better with a different choice. You also might see that ammo with different bullet weights won’t always look alike. One weight might have a more rounded tip while another is more squared off and blunt. While this isn’t always dependent on weight, it’s one factor that can affect the shape – also known as the profile – of the bullet. Certain handguns in particular can be more or less reliable with different profiles. If you have a gun that has trouble feeding what you’re shooting, changing the weight of the bullet in your ammunition can change the profile, and with it, help your gun work better. As you can see, you can change quite a few things about the way your gun shoots without the hassle of making changes to your equipment. For the price of a few boxes of ammunition, you can make your gun shoot to its sights, change how its recoil feels in your hands, and even make it more accurate and reliable. So what are you waiting for? Go shopping, shooting, and experiment!